This high intensity LED flashlight is ultra-bright and zoomable, allowing you to focus or disperse the light. Has three modes: high beam, low beam, and an emergency flash. Fish eye lens is 1x2000 zoom. Also features a powerful magnetic base, so you can attach this wherever you need light. Base has a 9" flexible clamp arm for additional mobility. Includes the LED light, base, plate, and 3 AAA batteries. I bought this item because of low lighting in my shop. Im able to transport it around to different pieces of machinery and it is my source of lighting while cutting, drilling, or whatever I need it for. The magnetic base is very strong, and the movable neck is perfect in tight positions. You can remove the flashlight and use it separately whenever needed and it only takes a couple AAA batteries. The lense adjusts the light from pinpoint to wide coverage. This is a MUST HAVE for any shop! Excellent quality, strong magnet stays where you put it. Love the flashlight too -- adjustable aperture so that the focus is either on a spot, or across a wide area. Strong enough to light up your work area from a couple of feet away. II is perfect- convenient and has helped tremendously! No quality here one to them would not work & I did not even get credit for that. I like being able to put it wherever it's needed without worrying Abbott a cord. The light is very bright ant very blue, like most "white" LESs. This is just a flashlight with a mag base, I already have two or three of this flashlights. 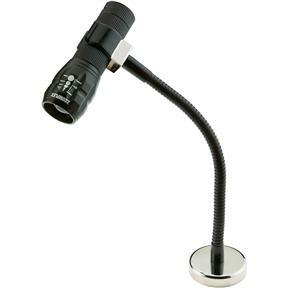 Purchased this when we bought the 14" Deluxe Bandsaw hoping that it would attach to the side of it and aid as a work light when cutting. Works great for this!